If you are separated or divorcing, or even just thinking about it or know someone who is, this book is a must-read for you! This is your essential and comprehensive guide to help you through this challenging time. What’s wrong with the way most people divorce? If I don’t want to go to court, what are my other choices? How do children really deal with divorce, and how can I protect them from the usual “fallout” I often hear about when people divorce? What actions can I take to keep the most cordial relationship possible with my spouse? Why do I feel okay some days and like I’m losing my mind others? What is collaborative divorce, and is it for me? What if I just can’t talk to my spouse at all? What about the house and the money and the 401(k)? Do yourself a favor. Buy this book and read it cover to cover before you go to a lawyer and before you make any more decisions. It will inform you, support you, and give you the critical information you need to be a proactive player in this process. It will definitely save you time, money, and your sanity! I got my divorce for less than the lawyer’s retainer fee. Went right to mediation. Difficult but civil. I was proud of myself. So – your book is right on the money. 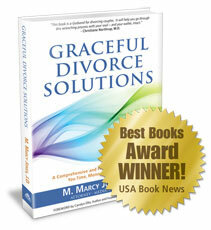 So here’s my quote: “Graceful Divorce Solutions is a Godsend for divorcing couples. It will help you go through this wrenching process with your soul – and your wallet, intact.” Bravo! If you care about your well-being and the well-being of your children while going through a divorce, you need to read this book. I will certainly recommend it as a resource to my audiences. This easy-to-read guidebook, written by a seasoned attorney, provides all the basic information to help you maneuver the often treacherous path to divorce. Marcy Jones writes from the heart and gives the reader a laundry list of important suggestions that will save you from the usual escalations that often accompany divorce. For your sake, and the sake of your children, read this book and learn how you can save yourself from making disastrous mistakes. Marcy has done a first-rate job of explaining the vital importance of choosing the right divorce process and the right professional helpers for clients who want to conserve resources, behave with civility, and keep the focus on the children. And, she helps you understand step by step how to mobilize the appropriate divorce conflict resolution process, rather than falling by default into a lawyer-driven conventional divorce that has no place for values-based joint problem solving. 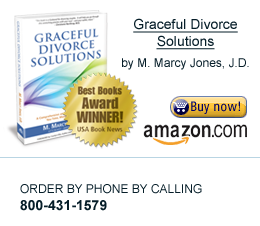 Graceful Divorce Solutions is indeed a virtual first consultation with a wise divorce counselor. It provides the information that divorcing couples need – information that they rarely will be given during first interview with conventional divorce lawyers. This book is a must-read for anyone facing the prospect of divorce. With straightforward language and offering a clear approach, Marcy puts you back in the driver’s seat so you can navigate your divorce with more power, ease and options. What you’ll learn from reading this book will save you literally thousands of dollars if you went through this learning curve in a lawyer’s office. In Graceful Divorce Solutions, Marcy essentially provides you with your first legal consultation. You learn about the different processes for divorcing, as well as the issues that you need to be thinking about. Divorce is an unfortunate reality in our society, but finding ways to reform and humanize it makes us all winners. Graceful Divorce Solutions offers a clear roadmap through the legal solutions, which is one of the most intimidating and daunting pieces of divorce. Whether you are going through a divorce now, thinking about separating, or wanting to support a loved one in the process, this book is an indispensible resource and will help to anchor and guide you along the way. It’s a resource that has my highest recommendation. Conventional wisdom has decreed that divorce is something that is done to the participants. M. Marcy Jones, in her new book, Graceful Divorce Solutions, sets forth, in a clear and comprehensive manner, options for divorcing by electing from processes that allow proactive participation. This book is a great place to start your divorce education. Marcy takes a strong stand – this book is different, practical, and quite visionary. There is so much helpful takeaway for the reader, from the broad to the intricate – it makes the book a very helpful, almost indispensable manual. It’s like an initial legal consultation, but much less inconvenient and stressful than setting up an appointment with a lawyer…not to mention much less expensive! And it will PREPARE the reader so well for that first real meeting. I am thrilled to have this clear and concise resource to offer my clients who are contemplating divorce or who have decided to divorce. Graceful Divorce Solutions provides exactly the kind of information we all strive to share with our clients, but so often is lost in the emotional upheaval of the moment. Now our clients will have this as a reference book to use as they need and on their own time – to help them absorb this information and to keep what is really important at the forefront. This is the definitive “go to” book to recommend to anyone, client, family or friend, who is going through a divorce or considering one. It’s written by a “real” human being who experienced divorce and has years of experience as a family law attorney, so it covers the gamut. My only regret is that it wasn’t in my hands years ago for the many folks I’ve seen that needed just this experience to inform them. The process of divorce is un-empowering for so many people. Knowledge is power, and this book will empower anyone – just to know what the divorce process will look like, how it might feel, what their choices are, and have an expert telling them that they can do this in a graceful way! Marcy is a seasoned lawyer, skillful mediator and ace coach. Throughout Graceful Divorce Solutions, Marcy’s consistently strong, constructive, and nurturing voice support the reader through all of the choices that need to be made during divorce. This book normalizes and humanizes the process and offers effective alternatives to conventional divorce. Marcy encourages taking the highest road possible, bringing your best self to the table and moving through this time with integrity and kindness. She also helps readers be proactive-which includes finding a lawyer to partner with, rather than just blindly turning it all over to a lawyer. There’s never been a more inspiring and fresh approach to divorce! Graceful Divorce Solutions by Marcy Jones fulfills its subtitle’s promise to save you “Time, Money, and Your Sanity.” As a lawyer, Jones realized the need for people to understand their options when divorcing, and for lawyers to understand the emotional component of divorce. She thoroughly explains why the legal system should not be involved in most divorce cases-the legal system’s way of turning a husband and wife against each other is not conducive to ongoing communication between the couple after divorce, and especially not beneficial to the children’s welfare. Admittedly, lawyers have a bad name, but Marcy Jones has written a book that redeems many of them by showing that lawyers can care about people rather than just fighting with each other and billing their clients for their time. Graceful Divorce Solutionsis not the normal process book, but a book about the emotional foundation underlying the experience of divorce. This book is an essential tool not only for the individual contemplating divorce, but for any counselor, advisor or friend who can walk with that individual during the divorce transition, to guide and keep them on the path of their deepest values. Marcy's book educates you about divorce and child custody processes so that you can make wise choices about the particular process you use, and she helps you select the right attorney to guide you through the process. As an experienced family law attorney, Marcy knows that those initial decisions at the very beginning of the divorce affect much more than the resulting divorce and child custody arrangements. They govern the potential success of your co-parenting efforts, and they affect the future emotional health and welfare of your children.